NEWOur original designed pistol bit with new mouth piece, we now offer it in a high port with a copper roller mouth.Stainless Steel Pistol Shank Show Bit with attached chain curb.Specifics:5 mouth with 7 cheeks (cheeks are measure from trigger to end of barrel)Port is 2 1/4 wide by 1 7/8 tallOur pistol bits are custom made for our store. Patterned after an original Colt 45, that my Grandfather carried into Oklahoma in the Land run. 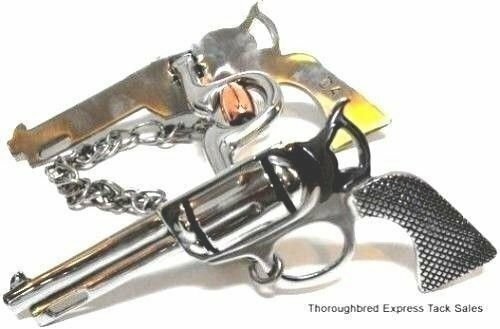 Compare to other pistol bits being offered for much more money. Look close, you can see the difference. This is a well made bit with a nice heft to it. Nice for show or just for a conversation piece. Black steel Jr. Cutter high port show bit, hand engraved silver overlay on trim, 5" sweet iron high port mouth with copper roller and copper inlay. 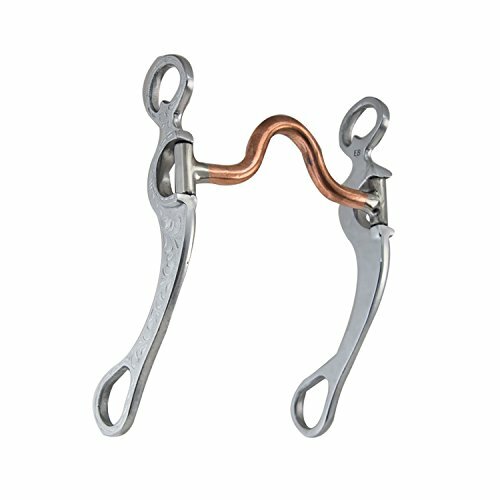 FeatherLite Pro Series Aluminum Bits by Southwestern Equine These FeatherLite Long Shank Show Bits are just what you've been looking for. 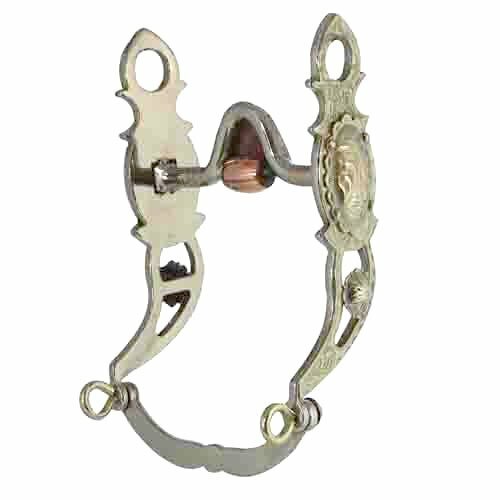 These beautiful engraved bits are made with you and your horse in mind. 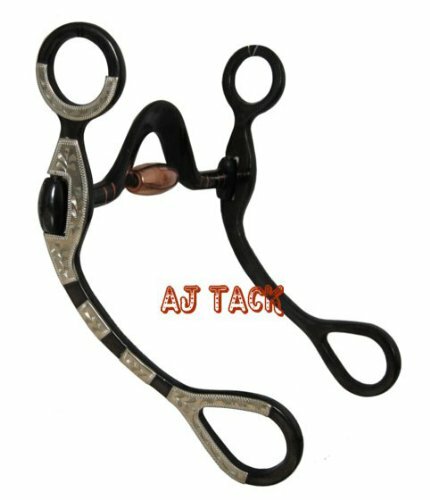 Now you can have a gorgeous bit with the exact mouth piece that makes your horse happy. All bits have an 8 1/2" shank and the same beautiful engraving. The shanks are aluminum and extremely lightweight. 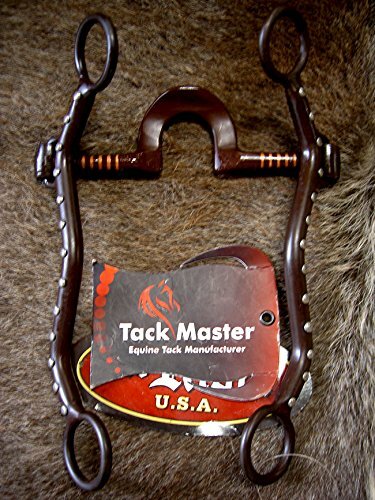 Now you get the shank support you need without having such a heavy bit for the horse to carry. 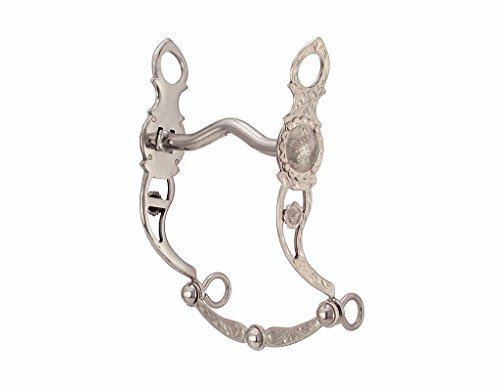 Why FeatherLite: ✓ Light weight; easier for your horse to carry ✓ Many mouthpieces to choose from ✓ Mouth Piece's are still solid metal to keep horse from chewing through the softer metal ✓ Beautiful Engraving on the shanks to give you that "show bit" feel for any ride. 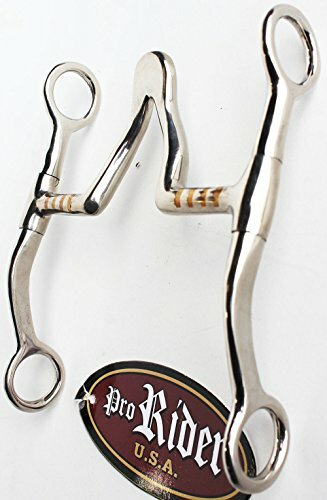 ✓ The longer shank produces more leverage than a shorter shank, but is slower acting ✓ Bits that have broken mouthpieces are slower acting and provide the horse with what essentially amounts to a preparatory signal. Western Mini Horse High Port with Copper Covered Port with Roller. 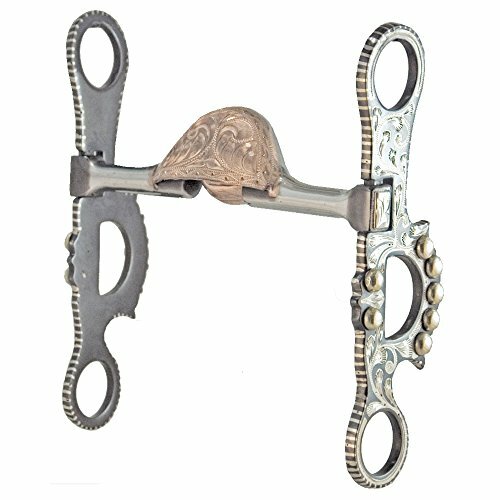 Show Bit This new bit from Coronet is the finishing touch for a western mini show horse. German Silver engraved overlay and conchos with copper roller and covered port. Size: 3-1/2, 3-3/4 and 4 Suggested Retail $63.59 Our Price $56.99. Engraved Bit with Copper Port and Inlaid Silver Intricately engraved show bit with beads on shaped cheeks complimented by inlaid engraved silver. Medium high copper port that is also engraved on the top. The shanks on this bit measure 6 with a 5 inch mouth with copper inlay. Inlayed Silver with hand engraving Size: 5. Falling at *MAX* HEIGHT - Can a PORT-A-FORT save you? - Fortnite: Battle Royale!